It’s two from two for Eddie Jones’ England and with struggling Italy and Scotland at home in their final two games, the general consensus is that Wales are the side most likely to derail their grand slam bid. As Bernard Jackman pointed out, Warren Gatland’s men will pose a different type of threat than what they have faced so far. Certainly their attacking game is likely to face a sterner examination. Ireland opted for Robbie Henshaw at full-back and England took advantage of the personnel change in the back three, while France were all at sea in that department at Twickenham. With two centres on the wings and a wing at full-back, Jonny May and his team-mates ran riot against Jacques Brunel’s beleaguered side. In Cardiff, Liam Williams is likely to be in the 15 jersey, with Leigh Halfpenny battling to resume playing after his recent concussion. Both are formidable operators. George North will return on the wing, with Josh Adams likely to keep his place on the other, while a midfield partnership of Jon Davies and Hadleigh Parkes has organisation and defensive nous written all over it. All in all, the vast areas of pitch afforded to England at times in the opening two rounds is unlikely to be replicated in the Welsh capital. Joe Schmidt changed a third of his side against Scotland, with Josh van der Flier’s demotion the only tactical alteration. Chris Farrell had a quietly effective game on a day that was more about the collective. 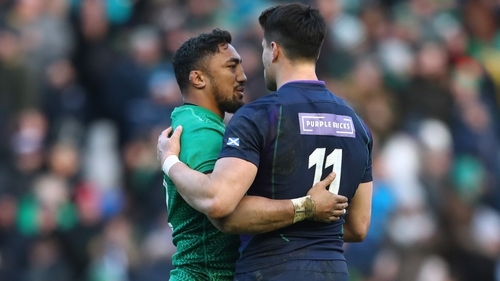 His midfield partner Bundee Aki had more carries, passes and tackles than Farrell, but his work-rate was evident throughout, never more so in chasing down the Scottish defence in the mix-up that led to Conor Murray’s first-half try. Rob Kearney was his usual resolute self at full-back, and looked threatening on the front foot too, with only Jacob Stockdale (6 beating more defenders than the Leinster man. 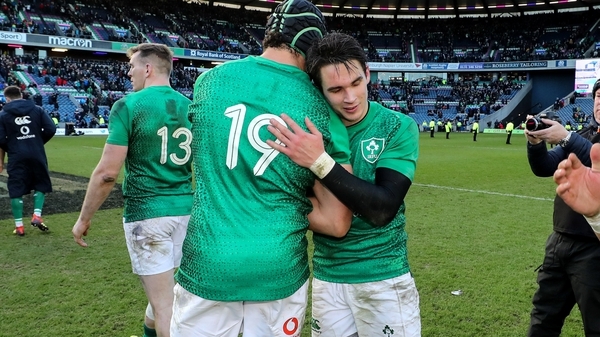 Quinn Roux made the most of the absence of Iain Henderson, Devin Toner and Tadhg Beirne to show what he can offer. The Connacht lock arrived at 54 rucks and made 25 clearouts – topping the charts on both counts – to illustrate the fact that much of his work can go unnoticed on the pitch. In the backrow, Sean O’Brien will be delighted to have come through 63 minutes and was effective at the breakdown as well as making 16 carries (only Louis Picamoles and Josh Strauss enjoyed a higher tally over the weekend) while Jack Conan, a bit like his team, got through most of his effective work in the opening 40 mins. Among the replacements Dave Kilcoyne, Ultan Dillane, John Cooney and in particular Joey Carbery, also got more valuable game time in green. Can Wales halt English charge? It is hard to ignore the fact that France were a shambles on Sunday, but you couldn’t but be impressed by the ruthlessness of the hosts. The pack is bristling – Kyle Sinckler seems to enjoy living life on the edge when it comes to the match officials – while Owen Farrell exudes class and composure with every involvement. The English midfield has a better balance of guile and defensive nous, while the back three is in blistering form, but can Wales do a number on the visitors next time out? Victory in Rome, an 11th successive win, matches the Welsh’s all-time run and after mixing things up with team selection, the likes of George North, Liam Williams, Hadleigh Parkes, Gareth Davies, Rob Evans and Alun Wyn Jones and Justin Tipuric all expected to return, it is a significant challenge facing Eddie Jones. Judgement is best served from round one given the personnel involved, and while the first half was a torrid start to the tournament, the resilience displayed in overturning 16-0 interval deficit was highly impressive. Recent history is on England’s side, a 21-16 win in Cardiff in 2017 sandwiched by victories at Twickenham. "No one is looking ahead to the World Cup". Does that line sound familiar? You may well have heard that statement from just about every Six Nations player and coach put in front of a microphone over the past couple of weeks. It is hard to blame them of course when they are asked repeatedly about the looming competition in Japan on the horizon and its impact on this year’s Six Nations. The party line has been the go-to response, but even if it won’t be said publicly, is there anything to be taken from what we have seen so far in the Six Nations. With Ireland and Scotland set to lock horns in 223 days in Yokohama, can we read much into the result in Murrayfield ahead of the Pool A clash down the line? "I was talking to Andy Farrell [Ireland defence coach] before the game and we were talking about how Yokohama feels like another world," Gregor Townsend said after the game. "We've got a pre-season to get through, a World Cup camp to get through to the first game of the World Cup so how well you do in your World Cup camp, how well you feel your game is in place in those friendlies will be much more relevant than the game at Murrayfield." The personnel is likely to differ somewhat with injuries, but Scotland, as the home team, seem to run out of ideas in the second half in how to break Ireland down. Their reliance on Stuart Hogg, who departed in the first-half, was evident while Finn Russell showed that with enough time and space, has the ability to bring into play his backline. The game also showed that an Irish pack with three key locks and CJ Standers appears to have the measure of its Scottish counterparts. Just how do you measure success for Italy? Head coach Conor O'Shea said pre-tournament that performances have to become more consistent, and if that happens, victories should follow. Their home reversal to Wales was their 19th successive defeat in the Six Nations, and a simplistic view would be to suggest that O'Shea's arrival has made little difference to the Azzurri. However, considering where they find themselves in the game, progress is not quite as black and white as wins and defeats. A win over Georgia in November was a boost for confidence, while the U20s got the better of Scotland two weeks ago. O'Shea has invested a great deal of time into looking at the structures of the game in Italy, and while the benefits of this may only come to fruition for the national team long after he departs, the performances of Benetton this year - currently second in Conference B behind Leinster - is encouraging. A Six Nations win is what they crave however, and a revival Sunday week would end any Irish ambitions of retaining their title. The hosts showed plenty of attacking intent and endeavour against Wales, and their tally of five tries thus far is the same as Joe Schmidt's team, and have only conceded two more than the men in green.